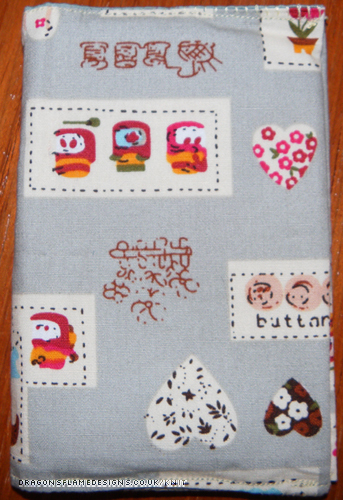 I found this incredible fabric in the sale for just a pound per metre. I’m honestly not sure what fabric this actually is; my best guess is a kind of canvas – slightly shiny and textured and reasonably thick. 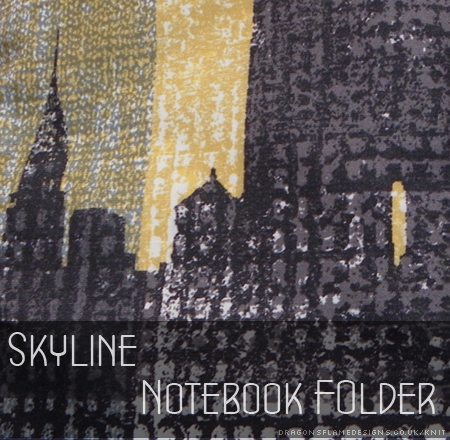 The fantastic pattern of silhouetted buildings would be perfect to make something for an architecture-loving friend, but I wasn’t too sure what I would be making. 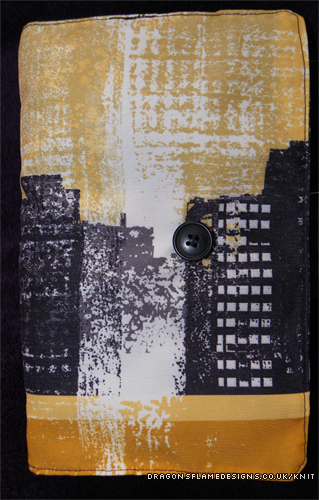 Going back through my folder of downloaded patterns, I came across the Notebook Folder Tutorial from Riley Blake Designs. I’d made one of these previously, but struggled to get all the layers through my Mum’s sewing machine, so I wasn’t too sure how this canvas would behave! The inside of each panel is a black polycotton which compliments the silhouettes and also helps balance the thickness of the fabric. I don’t trust my hand-sewing enough to stitch the button on by hand, so I machine stitched it on after completing the folder. 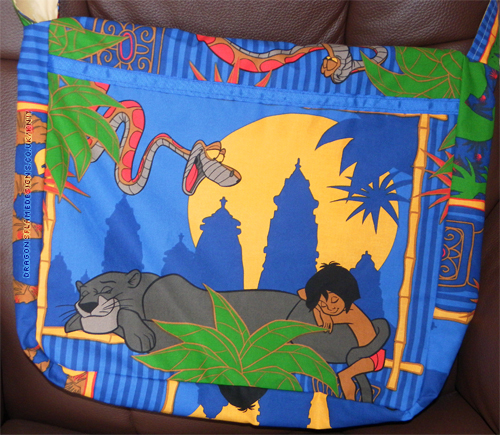 There was just enough space to sew it in while holding the slanted pocket out of the way. Inside the folder. 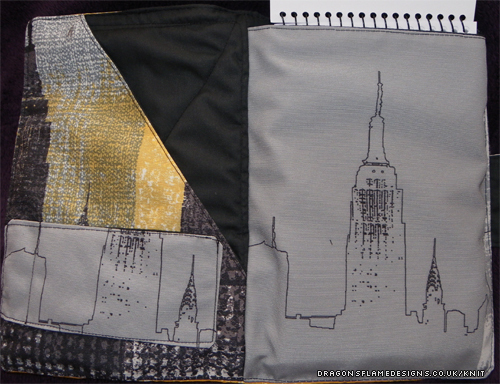 There’s a pen pocket on the left, and the pouch to the right is large enough to hold an extra large notebook! 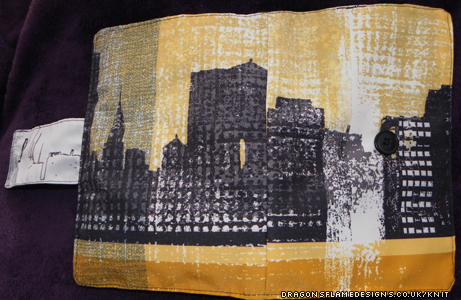 I decided to skip the interfacing as the canvas is sturdy enough without it. I couldn’t find any batting in my local shop, so I picked wadding instead and quilted it to the inside panel so it wouldn’t shift around as I turned the folder the right way around. I also cut the wadding shorter than recommended, leaving a half inch border around, to ensure the final seams wouldn’t overlap it. 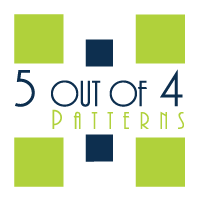 The quilting could be a bit neater; if I made another, I might try and make more of a feature of the quilting, picking a better pattern than a simple cross on the back. 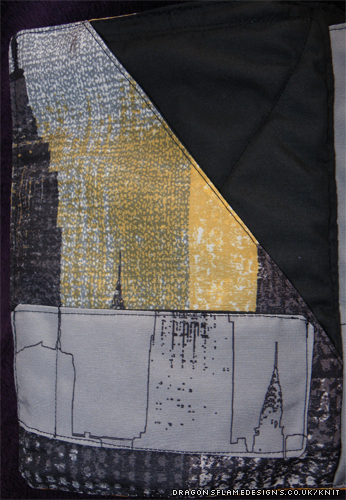 The inside cover – you can just about see the quilted backing behind the slanted pocket. I used a denim needle in my sewing machine due to the thickness of the canvas. It stitched really easily, which was a pleasant surprise after the struggles I’d had with the previous one on an older machine! Inside the folder, with the notebook lifted out of the way. There’s a couple of seams that aren’t entirely straight, mainly because I had the canvas layer on the bottom, and it seemed to slip as the feed dogs fed it through the machine. But overall it came out really well. 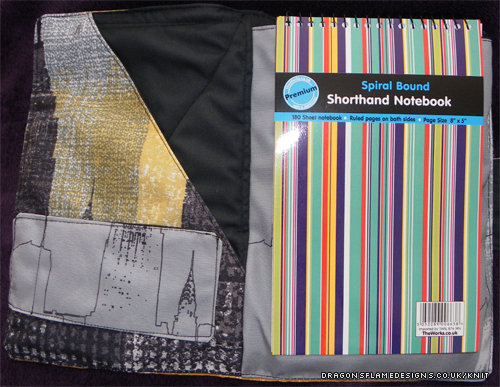 This entry was posted in Sewing and tagged bargain, Notebook folder, present, sewing, skyline on July 5, 2015 by Sewist. 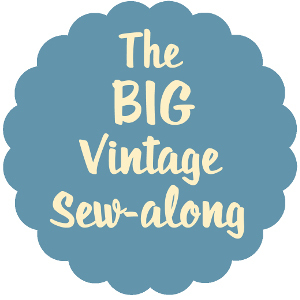 A quick little project or two…. I noticed that a friend was using a really tired-looking purse to hold her store loyalty cards, and decided it was about time I made her a little present. 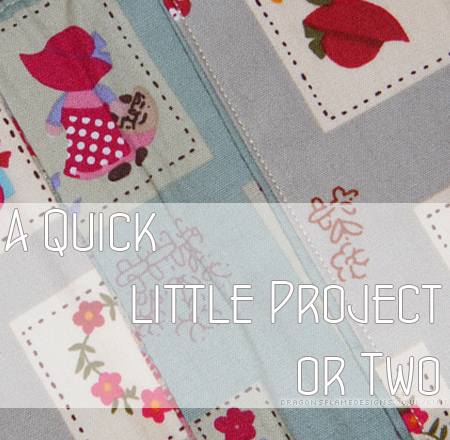 I had some fat quarters left over from my last Hobbycraft purchase, and found the perfect tutorial at Midwestern Girl for a wallet – it’s a perfect size for those loyalty cards, and should save her needing to use that tired old purse any more! 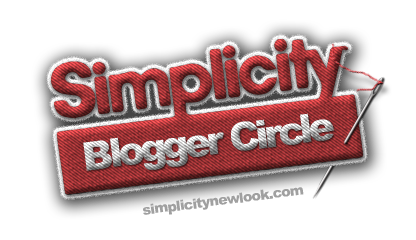 If I made another one, I would try to get those corners turned out better – that really lets it down on looks. But it’s practical, which is the whole point 😀 I think I would also add a button & elastic to hold it closed, as it’s made quite loose (to fit as many cards as possible in), but that does mean the cards slide about a bit in the pouches. 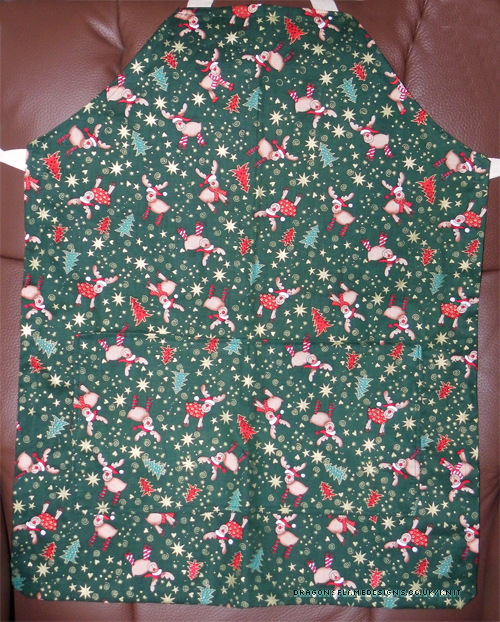 While I was in a sewing frame of mind, I thought it was time I made my Christmas apron for Gran. Yes I know it’s now March, but Gran requested Christmas fabric for Easter! You can probably just make out the pocket in the photo – that’s slightly higher placed than the last apron I made, and the top is slightly narrower than the first apron, although I think it needed to be slightly wider than I have it. The straps are simple cotton herringbone tape rather than being made out of the same fabric – Gran prefers them to look like that. 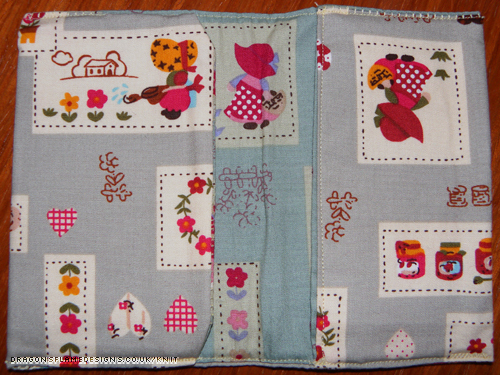 This entry was posted in Sewing and tagged apron, card holder, fat quarters, present, sewing on March 12, 2015 by Sewist. 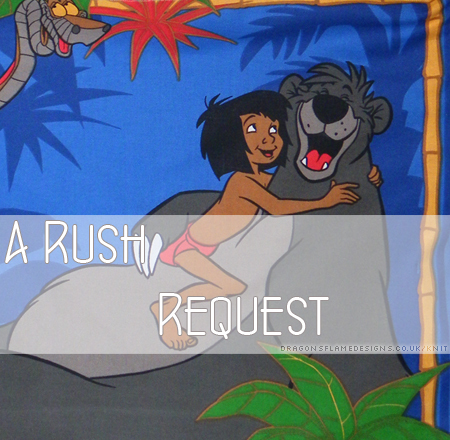 I heard from a relative that he was going to be a daddy 😀 ….only trouble is, he told me about 3 weeks from the due date, which didn’t give me much time to make something! 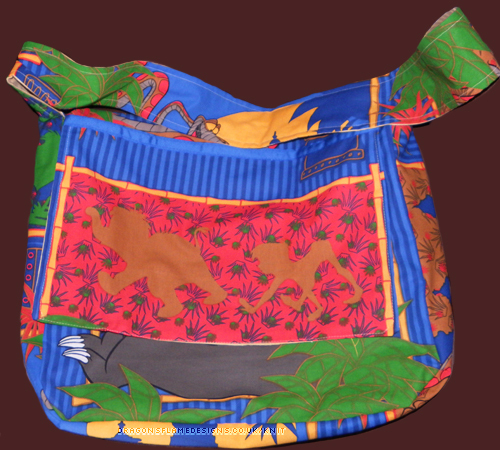 I’ve sewn a couple of messenger bags using the tutorial from Crazy Little Projects before, and knew I could make one in quite a short space of time…. 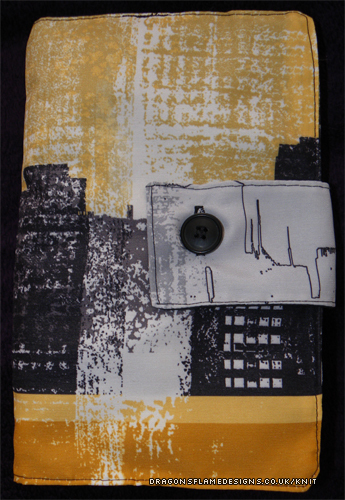 and I’d found the perfect fabric in the sale at just one pound for a metre! 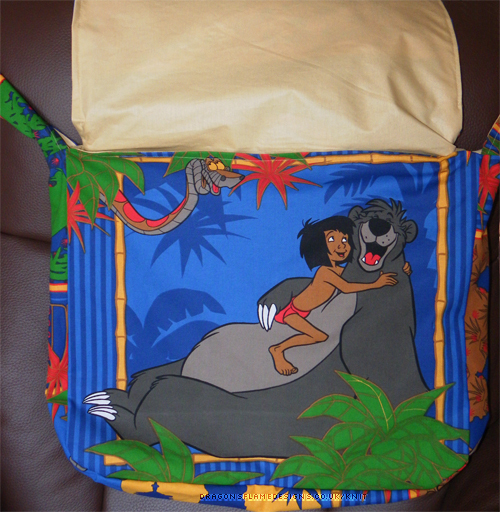 So here we have the Jungle Book Nappy Bag…. The panels are (almost) fussy-cut, so the characters lined up nicely. I still can’t get the lining to behave though; it always appears too small when I start, and way too big once I sew the final stitches. He should be just the right size for little hands to grab! 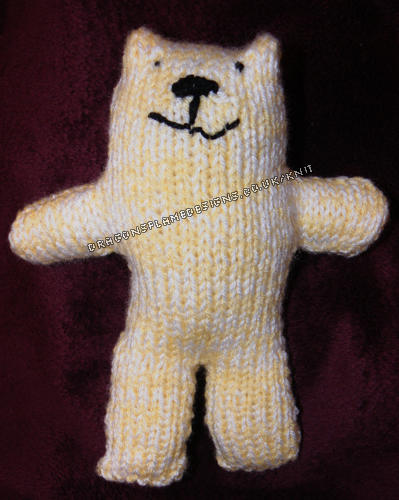 This entry was posted in Bags, Knitting, Sewing and tagged bag, bear, knitting, messenger bag, present, sewing on March 10, 2015 by Sewist. 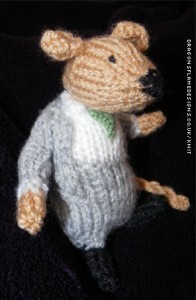 I’ve finally finished the knitting project for a friend’s wedding…. ….meet the Wedding Mice! 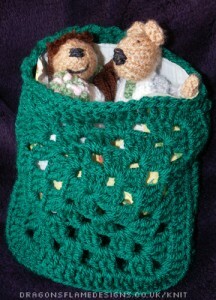 The bride and groom have chosen a green colour-scheme for their wedding, so I thought I’d crochet a green granny square bag for the mice to sit in. 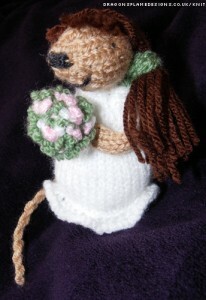 Bride Mouse is roughly modelled on the bride-to-be, although I did change the hair colour to something that worked better in wool! Her traditional style white wedding dress allows her to show off her bouquet of flowers, and once I finally figured out how to create her hair, the green hairband sets it off perfectly. The Groom Mouse’s colour scheme is hopefully accurate to what my friend will be wearing on his wedding day – I’m sure I confused him by my questions for what colours everyone would be wearing! He has a grey suit (the jacket was a “make it up as you go” attempt, as I don’t have a specific pattern for that), black shoes, a crisp white shirt, and of course a nice green tie. No hair for this mouse (thankfully), but a slightly lopsided pair of ears. So there you have it, the bride and groom, and they should arrive fashionably early for the wedding…. about two months early! But then it’s better to be early with a wedding gift, rather than rushing at the last minute. 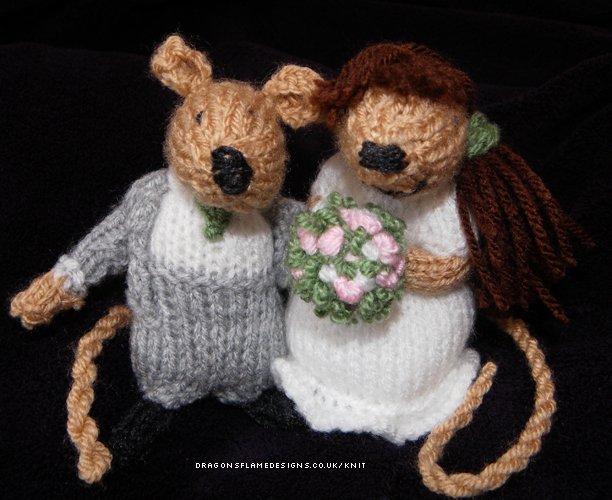 This entry was posted in Knitting and tagged bouquet, flowers, green, hair, knitting, mice, present, suit jacket, wedding, wedding present. gift on July 11, 2014 by Sewist.